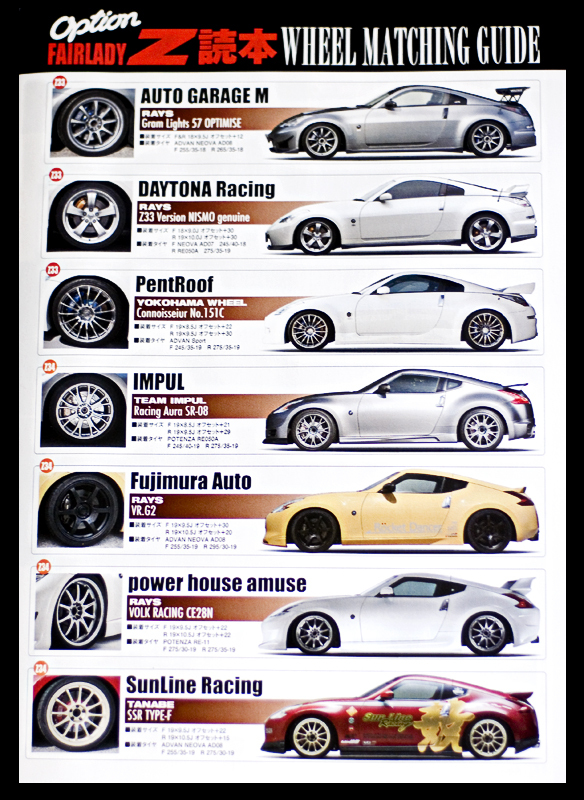 I was browsing over the newest Option mag this morning over some coffee and came across this ワンメイクTUNEガイド (One Make Tune Guide) for the Fairlady Z. On the back page was a guide for matching some wheels. Since it was originally built in 2009, I’ve always liked the Sun Line 370Z so I was pretty happy to see it on the original SSR’s. Notice the maker of the Type-F though; Tanabe. Turns out SSR went bankrupt in 2nd quarter 2009 and were bought out by Tanabe, which kept manufacturing them as SSR’s. I suppose I should start paying more attention to these things. The more you know!